Our staff understands how important your brand is to your company. They understand that timing may make or break a product launch or event. That is why our staff is trained to understand exactly how long projects will take to produce. Everyone at DPI strives to adhere to the highest quality standards and will not take shortcuts. We have the right people, the right technology, and the right attitude to help you get the job done. Our skilled pressmen (and women!) have a keen eye for color and understand the importance of color to your brand. We are happy to accommodate press checks. Our whole team, from account managers to prepress and production, has experience working with the Pantone Matching System. Thanks to our PMS color mixer from Sun Chemical, we also mix our own colors in house, reducing storage and waste. The offset printing department at DPI is all about quality and reliability. We proudly partner with Komori for the most innovative 40″ offset press in San Diego: the six-color Komori Lithrone G40 H-UV for sharper images, more saturated color and no dry time. This system produces higher quality print faster than conventional offset printing. DPI Direct has two other offset presses to round out the department. The Ryobi 524 is a four-color workhorse with a 14”x20” max sheet size and the Ryobi 3302 is our two-color press with an 11″x17″ max sheet size and is good for a for a variety of envelope sizes. DPI Direct employs G7 color process through the plant. G7 is a process of color calibration, a method that allows DPI Direct to gain repeatability across multiple of printing devices and substrates. The beauty of H-UV is the ink does not sink into the substrate, which maintains the highest quality offset printing on coated or uncoated substrates. Our environmentally-friendly inks allow DPI Direct improve turn times without compromising quality. Full page quality control. 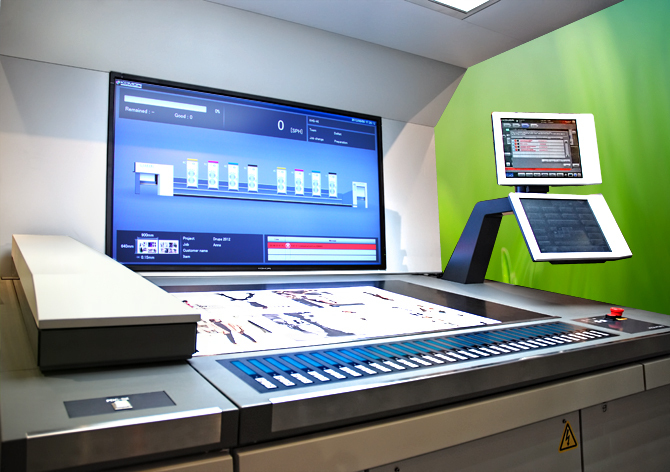 The Komori intelligent console automatically registers and calibrates ink density across the entire page rather than just the trailing edge. This allows DPI Direct to produce pages that are consistent throughout your product. DPI Direct’s inline and offline UV coating capabilities are tremendous. Flood or spot UV is not a problem. Create eye-catching effects that will separate your next marketing piece from the clutter. DPI Direct’s diverse product mix and talented staff have formed to make a truly unique organization. An organization that that can design, produce, and deliver on time and on budget. DPI Direct can nimbly help your business develop, maintain and mature marketing programs that will grow your business. Call us today to set up a meeting. Research shows that personalized campaigns out-perform others, which means that personalization is key for businesses. Through variable data and personalization DPI Direct can ensure that your direct mailing campaign has a greater impact. At DPI Direct, we provide complete direct mailing services to help your company develop a successful marketing campaign. We provide design and postal consultation to help your business create a competitive image while complying with postal regulations. We also take care of printing and binding, saving you time and money with our competitive costs. When it comes to sending out your direct mailings, our systems find the lowest available postage rate to ensure that your budget requirements are met. DPI Direct’s variable data printing (VDP) is a form of digital printing in which elements such as text, graphics and images may be changed from one printed piece to the next, without stopping or slowing down the printing process, using information from a database or external file. For example, a set of personalized letters, each with the same basic layout, can be printed with a different name and address on each letter. Variable data printing is mainly used for direct marketing, customer relationship management, advertising, invoicing and applying addressing on self-mailers, brochures or postcard campaigns. Whether you need fulfillment, kitting, pick-n-pack, or full distribution, DPI Direct can handle it all. Custom crating and world wide distribution services are also available. As a photographer, I set very high standards for my work. My eye is finely tuned to detail. I have a history of being rejected by labs for asking too much. In DigitalPro I have found the perfect partner. The entire crew at DPI works to the same high standards. I feel supported rather than at odds working with them. The work is extraordinary – as are the people. I owe them my thanks. DPI Direct has it all. When I want the best in fine art printing services, the best in full service and the highest quality possible for my fine art production I use DPI Direct exclusively. As a commercial and fine art photographer for the last 45 years I’ve seen it all. DPI Direct is the only company that I place my trust in reproducing my images. There is an old saying, “The paint brush doesn’t make the artist, but it can certainly ruin the painting!” DPI Direct hits the mark every time flawlessly. Thanks guys.